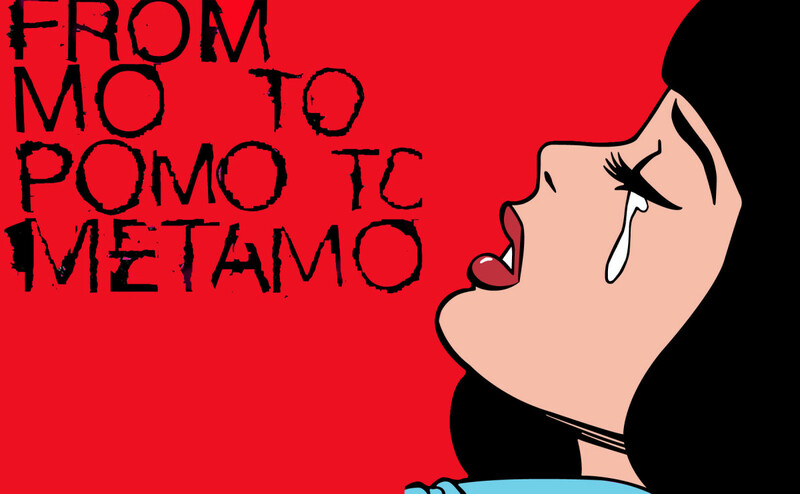 In laymens terms 'From Modernity to Postmodernity to Metamodernity'. In order to understand Metamodernism, you need first understand both Modernism and Post Modernism. Modernism was a period that effected art and philosophy in the early 20th century. Its emphasis was on Universalism, society as structure, construction, reality and capitalism, it was scientific and Phallocentric. It focused on family, social class, and science finding truth. Postmodernism is less easy to define as its fluidity and numerous definitions are elusive and hard to grasp. However, it can also be easily described as the after modernist period effecting art, literature, film, media and society. This means it describes the period after modernity. Its emphasis lies with Localism, society as spectacle,deconstruction, Hyperreality, and late capitalsim. It was humanity based, feminist and explored genderism. Many theorists attempted to define this almost indefinable thought which, when understood in terms of how they are each correct examinations of the era, lends itself to the vastness of the explanation of the term. Postmodernism focuses on fragmentation, families (of all kinds), breaking tradition, and science not being the source of all truth. It is a hugely Ironic and sarcastic era, where society not only questions itself, but does so through humour, satire and Pastiche. Where Postmodernism was Ironic, kitsch, and satirical, Metamodernism is an era that focuses on the lines between the sincerity of Modernism and Irony of Postmodernism. The Metamodern premise suggests we are stuck between the two, between knowledge and doubt, reality and hyperreality. 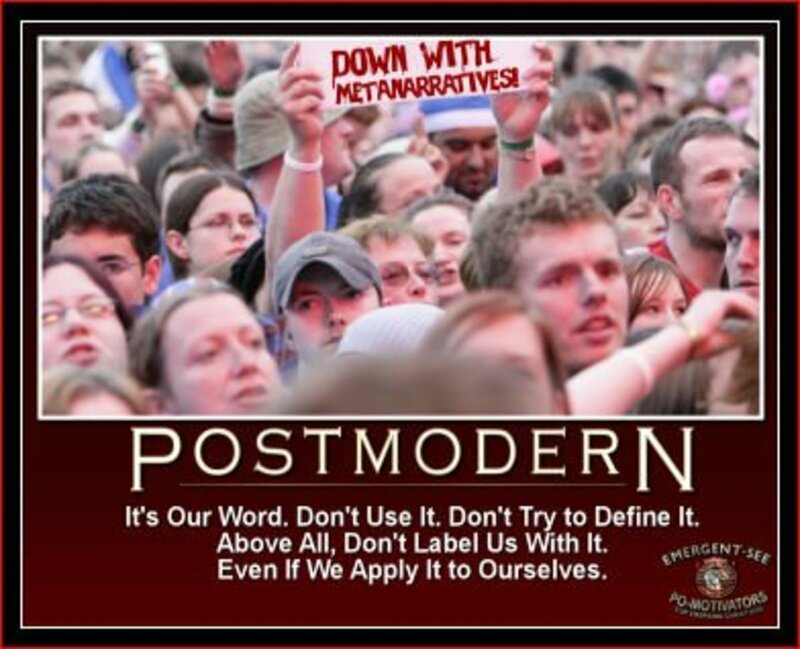 Since postmodernism was about the constant deconstruction, Metamodernity attempts to reconstruct life and society. It is the constant oscillation between two opposing points of view. As difficult as this may be to adults, some suggest that children are more capable of understanding this idea than adults. As adults the lines between reality and imagination are sharp and clear, but for children the two are intertwined, boundaries don't exist until they are taught what these boundaries are. 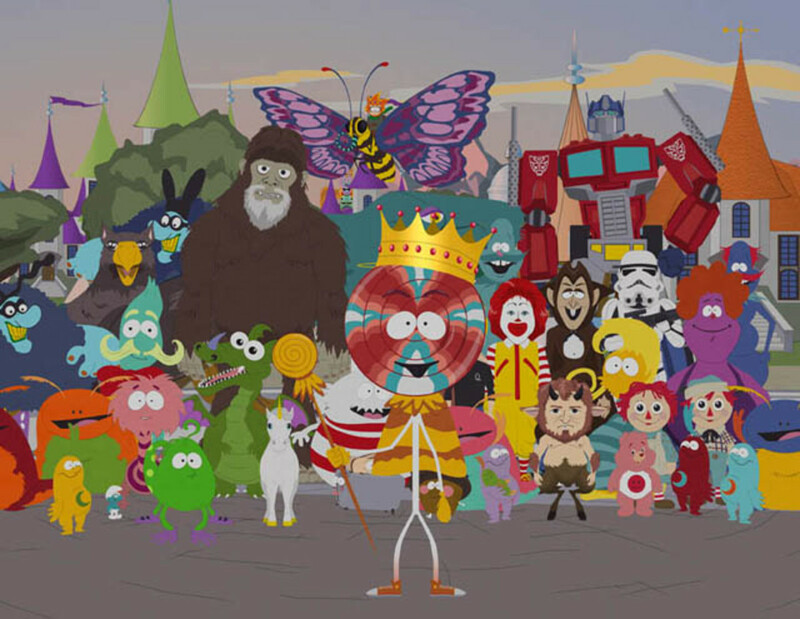 'South Park' (Trey Parker, Matt Stone. 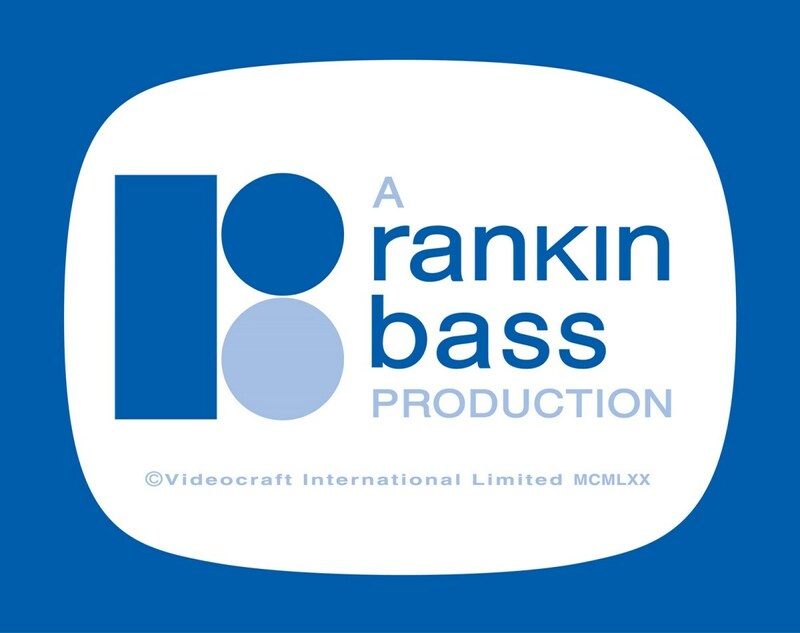 1997) is an adult animated tv show that begun with crude cut-out characters and even cruder satire. While it appeared to be simply another adult tv show that dealt with taboo issues through black humor, 'South Park' can also be seen as a progressive social and cultural construct. Since Postmodernism was the reaction to an era that people no longer felt hope in, 'South park' too can be seen as a reaction to the society and era it is set, first of which was Postmodernity, now though it appears they are keeping up with metamodern thought. The show is set around four young boys trying to make sense of a world that appears to make very little sense to their logical minds. They come up against the forces of society and culture in every episode covering aspects such as global warming, animal rights, hybrid cars, questioning religions, gay marriage, celebrity, feminist issues, capitalism, consumerism, massive global corporations, the sexualization of youth, and gender and sexuality. These are by no means slight issues, and although 'South Park' is essentially a comedy show, in keeping with post/meta Modern thought these issues are dealt with in a sincere and simultaneously satirical fashion. In fact 'South Park' is so contemporary and up to date that they are capable of keeping in with almost every major trend, and zeitgeist's of a specific time. For example, major societal issues affecting US society in 2008 were obviously the presidential elections, with Obama against McCain. Both Stone and Parker were able to produce an episode based around the result by simply acknowledging Obama's Popularity among voters. The Episode aired on November 5th, 2008, a day after Obama won the Presidency, entitled 'About Last Night' (Season 12, episode 12). 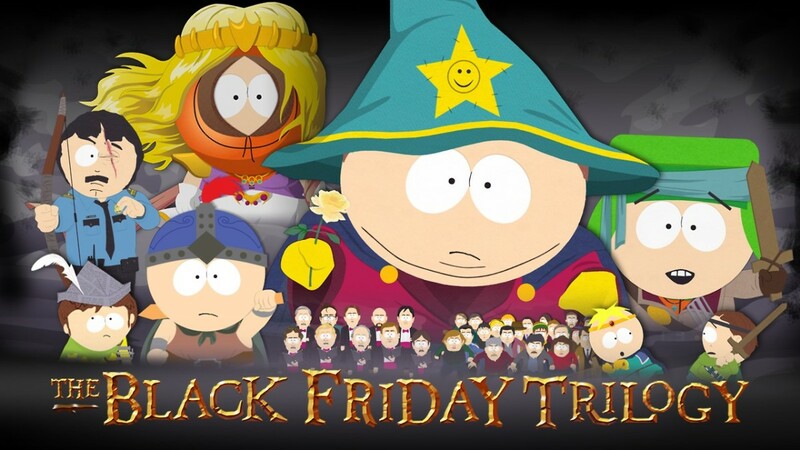 Another example of their relevance in our current cultural climate is their epsiode 'Black Friday' that was able to utilize two of the biggest trends in Winter 2013 alongside a cultural, consumerist holiday; Game of Thrones, the Playstation versus XBox wars and Black Friday. Stone and Parker's prediction abilities are also visible in the episode entitled 'Britney's New Look' (Season 12, Episode 2) where they portray the demise of Britney Spears as a cultural Sacrifice in order to reap a good harvest. In the episode Britney is hounded and harassed by paparazzi until she attempts suicide, ultimately failing but blowing off the entire bottom half of her face. Her managers and studio executives push her to continue performing and creating music, until she is finally killed by the violation of her personal space and right to privacy, when thousands of people flock to surround her and take her picture. The end of the episode saw the people of South Park happy, with vast amounts of fresh corn. The Tv shows a new up and coming Pop idol by the name of 'Miley Cyrus', and the shoppers turn to see their next target, their next harvest sacrifice. Of course, the episode is a satirical examination of celebrity status, rights to privacy and the sexualization of youth, by having ordinary people (who in reality listen to and follow Britney in a hysterical, obsessional manner) contribute to the physical and mental breakdown of young pop idols and celebrities. Miley Cyrus, almost predictably at this stage, did create a cause for concern after live performances where she emulated various sexual acts on stage, broke town in tears and appears to all to be following Britney Spears' footsteps. Once South Park was a postmodern reaction to society, culture and consumption, yet in keeping with the times, a shift in this thought is evident from previous, recent seasons. Metamodernism is seeping into their portrayals of these young boys, surrounded by idiotic adults. 'Grounded Vindaloop' (season 18, episode 7) is an episode where reality and hyprreality are hard to distinguish. It concerns gaming culture and the loss of distinction between reality and created worlds. The information and technological era is upon us, and people are spending more and time on gaming consoles, and computer games, adding to that the fact that developers have the ability to create worlds almost identical to our own, and equipment that can literally make a person believe they are standing in said word, then we have the problem of not being able to distinguish between the two. 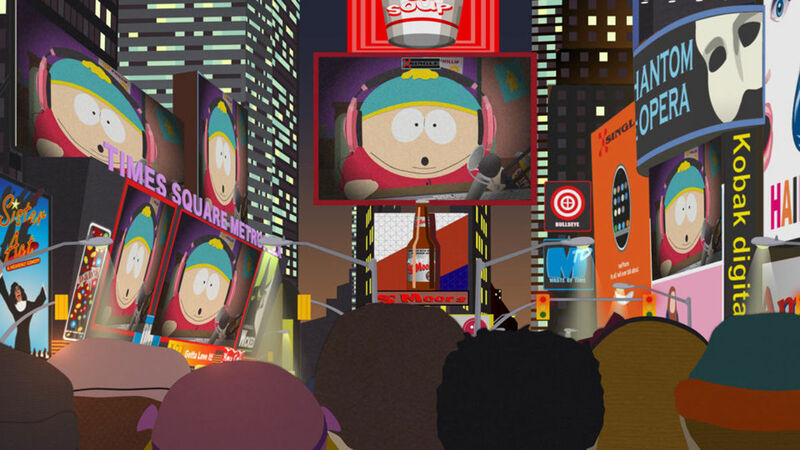 'South Park' examines this idea as Cartmen first assumes he is playing a prank on Butters, by making him believe he's in a video game, until Butters realizes that if he's in a video game, he can do whatever he wants. He Storms over to his parents and abruptly kicks his father before driving off in a car, and finding a prostitute who ends up stabbing him. Cartmen is then forced to convince Butters that he is stuck in virtual reality, but as the story progresses we the audience, along with the boys, simply cannot distinguish what is real, and what is happening in virtual reality. The end of the episode sees non cartoon characters standing around a computer as Stan takes off a virtual reality headset and comments that the games graphics could be better. 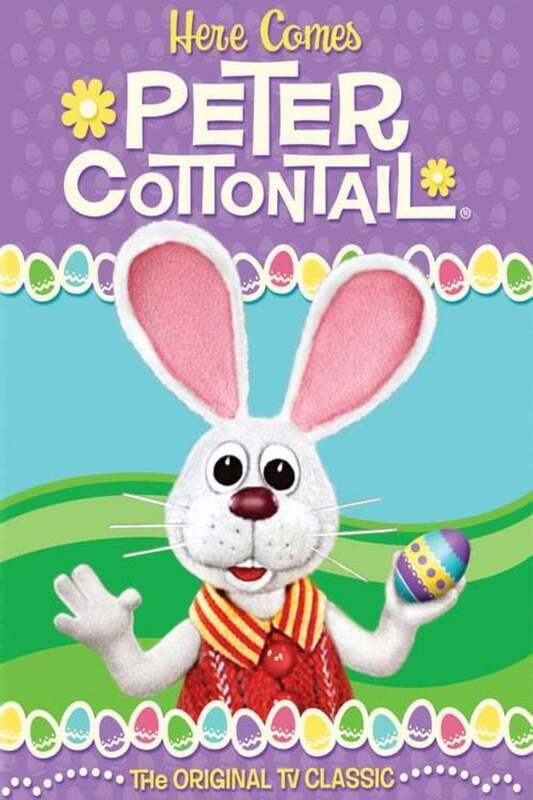 'Imagination Land' (Season 11, episodes 10,11,12) is another example of this Loss of Distinction, as it portrays a land filled with imaginary beings from Santa and the Easter bunny to animals and beings from advertising and games, however the good and bad beings are separated by a wall that gets blown apart threatening to wipe out imagination Land forever with the help of terrorists. Butters finds himself here and since he is the only 'real' person in the entire place, only he can imagine the murdered beings back into life, making him a God in Imagination Land. Something interesting exists with the fact that it is terrorists that threaten to destroy the imagination land. 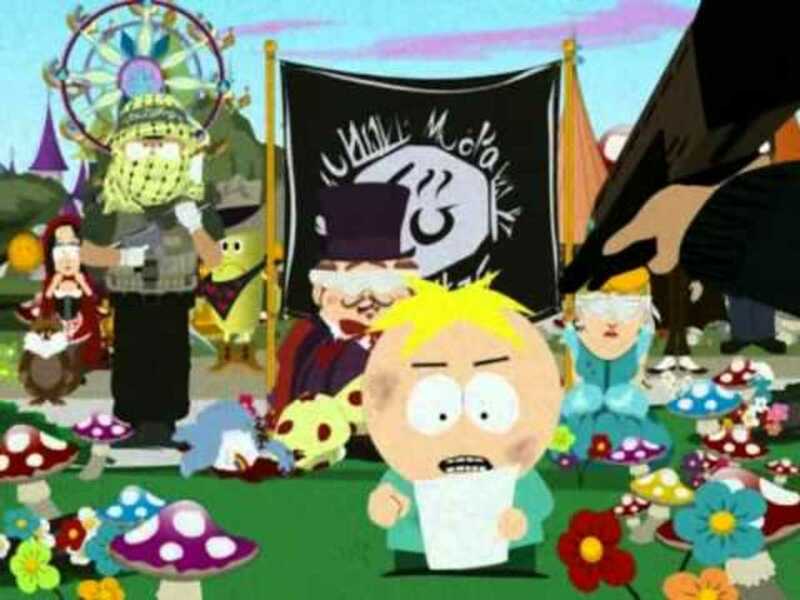 Parker and Stone present the government as attempting to fight something that isn't real, and we see Butters being held captive by very stereotypical terrorists, framed in the same way as many execution videos. So why it appears that the episodes are a reflection of how the government spends too much time and money on ridiculous (in the episode the Government hires directors and filmmakers to try to come up with an idea that will save Imagination Land), imaginary issues, yet at the same time, utilizing very real threats to society and people in the form of terrorists, (an even more relevant fact in light of the recent IS videos). Imagination land is also an extension of the Postmodern concept that once a character is thought it is brought into existence (See '6 characters in Search of An Author'), thus giving way to the Hyperreality theory. 'Happy Holograms' (Season 18, episodes 10, 11) is an episode that again deals with these same issues, in the form of Holograms and the Internet take over. 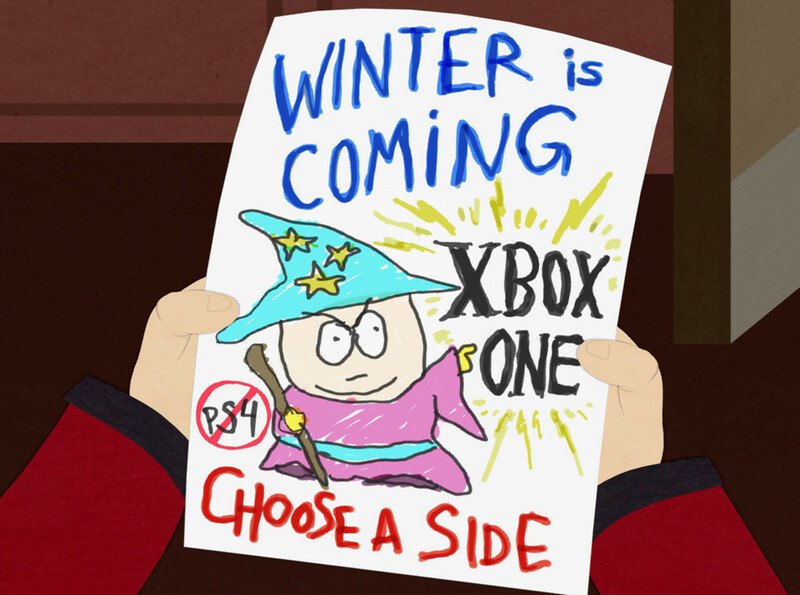 Children and adults alike (in South park and Reality) have stepped away from actually playing video games, to watching people commentate while they themselves play the game. The second episode begins with Kyle talking about the internet age, and the loss of family time spent together. He attempts to start a twitter trend under #savethelivingroom. 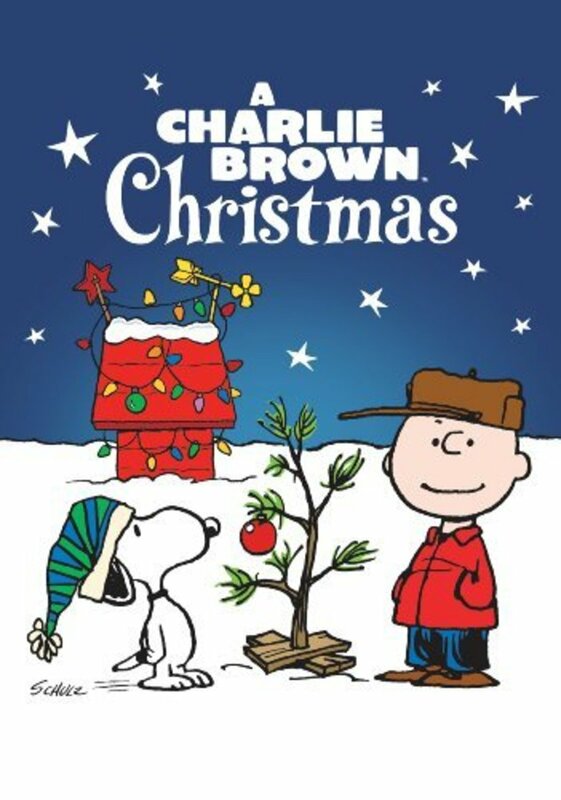 As the episode progresses, many separate issues are taking place such as the fact that Holograms of celebrities are beginning to become conscious, a Holiday Tv special filled with celebrities is advertising trying to gain as many viewers as possible and Cartmen has started his own Commentary show and can be seen at the corner of the tv commenting on different things that are happening throughout the episode, in a parody of the film 'Transcendence' and as a metaphor for the internet literally taking over. This feels chaotic and confusing, as viewers and fake tweets attempt to understand what's happening. Throughout the finale, a twitter feed can be seen at the bottom of the screen, feeding messages apparently from people watching the Holiday Special, but also from people watching 'South Park' that state "This better be leading to something! ", blurring the lines between 'South Park' as a construct and 'South Park' as a cultural being but also almost predicting what viewers of 'South Park' would think when watching the episode. Portraying An Internet takeover based on trending. Self awareness is a trait in Metamodernism, in that meta is a self referencing title: Meta-fiction is writing about writing, meta-film is film about film and so on. However this is not the sole characteristic as Meta can also be read as 'Beyond' or 'altered', therefor allowing Metamodernism to encapsulate ideas of beyond modernism as well as within modernism; the constant shift between one idea and another. 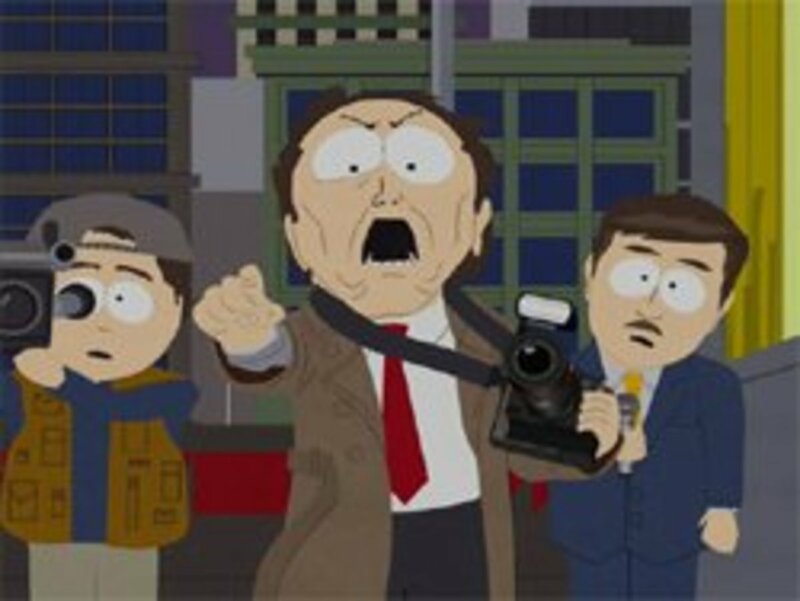 The self awareness of 'South park' is evident in many episodes, most notably however in the episode 'Death' (Season 1, Episode 6) where parents fight to get a cartoon show 'Terrance and Phillip' pulled due its 'Toilet Humour', certainly the show is solely based around crudely drawn characters and 'Fart Jokes', and it has gained a massive following from the youngsters of 'South Park'. A teacher explains to the children that shows like that "Don't expand your minds, These kinds of shows are senseless vile trash. You should be spending your time enlightening your minds with more intelligent entertainment". This idea that entertainment can be enlightening and informative as well as entertaining is one that 'South Park' themselves appear to follow. On the surface, the show is filled with toilet humour and bigotry, but below these obvious portrayals are immensely sincere and questioning attitudes of the effects of culture and society, or capitalism and consumerism. Another sarcastic and ironic effect in the episode comes in the form of the hysterical parents who campaign to get the show pulled, yet they themselves laugh at equally crass toilet humour when they contract "Explosive Diarrhea" and laugh at jokes such as "Got the green apple splatters". The episode then demonstrates a conscious awareness of the many debates surrounding itself and media censorship when at the end Stan says "I think that if parents spent less time worrying about what their kids watch on tv and more time worrying about hats going on in their kids lives, this world would be a much better place" followed by Kyles response of "Yeah, I think parents only get offended by Tv because they rely on it as a babysitter and the sole educator of their kids." Another episode that serves as an example of how 'South Park' questions itself and its medium is 'Simpsons Already Did It' (season 6, episode 7) where they attempt to rehash 'The Simpsons' plot lines, utilizing other satirical cartoons to refer to and criticize their own medium. 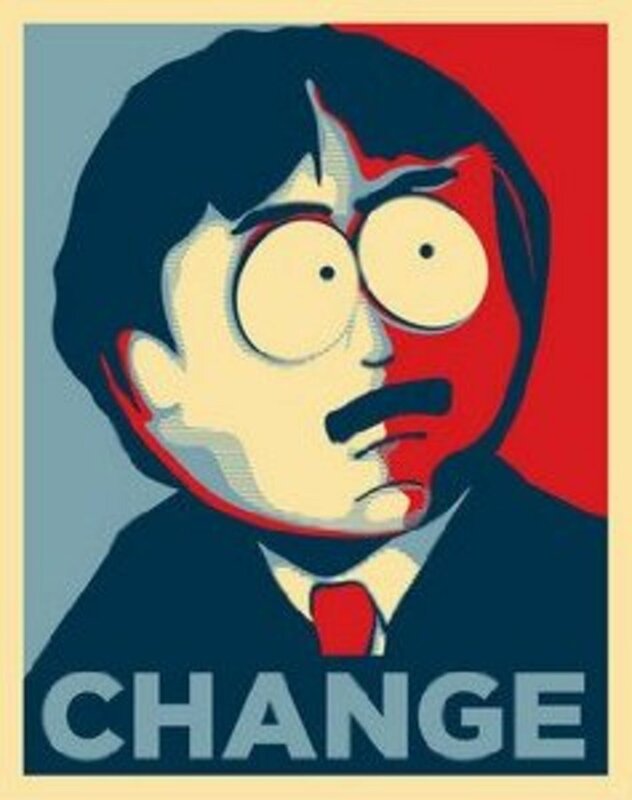 South Park is a cultural construct that is so relevant it keeps up with even the Metamodern era. Many seasons fall under the Postmodern Category but the most recent seasons utilize aspects of Metamodern thinking as a way of making sense of the chaos and deconstruction caused by the Postmodern period. 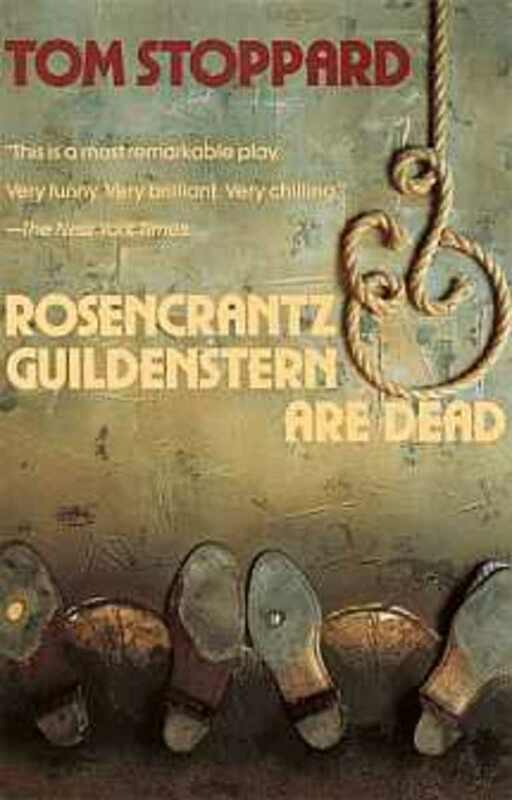 They use imagination and unreality as the backdrop to their social and cultural criticism. They question democracy asking why Democracy is primarily built around everyone having a voice yet nobody is heard, then juxtapose this with ideas of censorship and political correctness. The use of prediction is also a sarcastic and yet sincere way of saying we know what's happening, we've seen it before. and this is directed at every aspect of society and politics. Although many people argued in the past that 'South park' was simply another satirical comedy poking fun at what people are talking about at the time, it is important for people to be able to question what they are watching, and look beyond the obvious. 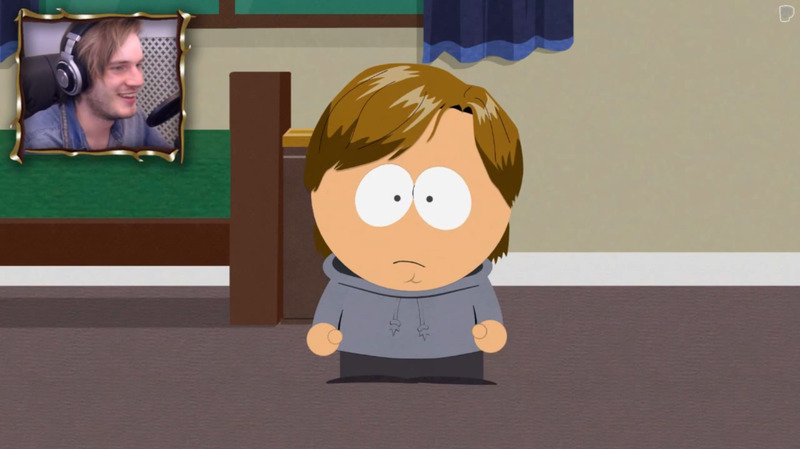 It is not a negative response to suggest that 'South Park' utilizes existing social anxieties or phenomenon in their episodes, or to say that they actively criticize every aspect of culture, every religion, and every individual person, regardless of what is deemed Politically Correct. And this is why 'South Park' is truly Metamodern, they are both sincere in everything they examine and question through the voices of four young school boys, while simultaneously portraying these issues in a sarcastic, ironic manner. As always this is meant as a study guide, I welcome any comments and questions. Of course there are no classes (Not in Ireland anyway..that I know of) which look at shows like South Park, however, it is a good cultural construct that could be utilized in classes on Postmodernism, Media, Satire and even Critical and Cultural theory. I have linked various articles, explanations and videos throughout the guide (highlighted in blue) so I hope these help to create a wider and more varied argument. I hope you found this useful, if not leave a comment on how you think it could be improved. If there are any other South Park related themes that you wish to study let me know, or if you want to check out the profile which has a list of things I write about, I am always looking for new study projects!